The Witham Bowls Club evolved from a meeting of ‘interested gentlemen’ in September 1904. The Club, therefore, is one of the earliest to be founded after the formation of the English Bowling Association formed by W. G. Grace in 1903. The first game of bowls in Witham was probably played at the Witham Cricket Club when the more senior members of that club grew tired of chasing a hard red ball around the wide expanse of the Cricket ground in Maldon Road. They started to partake in a gentler pastime of rolling bowls towards a jack on a vaguely level ‘green’ roughly prepared on the cricket outfield. In the season of 1904 there was ‘considerable dissatisfaction expressed with the inadequate accommodation provided by the Cricket Club’. Therefore, a ‘meeting of Gentlemen interested in Bowls’ was held on Friday 29th September, 1904 at the Angel Hotel, Witham with 11 members present. It was agreed to form an independent Club and that a committee be formed to ‘make an enquiry respecting a suitable ground and report to a future meeting’. The Cricket Club eventually agreed that a portion of their ground could be available to the Club at a yearly rental of £4(some £400 today) to include the use of mower and roller, as an experiment for one year only. Thus Witham Bowls Club was born. The committee met at the Cricket Club on 25th March, 1905 to select a portion of the ground on which to form the rinks. The season started on Saturday 6th May, 1905. At the AGM of 1913 the matter was raised that Witham needed its own green with ditches to comply both with EBA requirements and to entertain visiting clubs, matching their hospitality. Unfortunately any further progress was halted with the enormity of the First World War. While most members were not directly involved, the Club’s activities were curtailed. The green was made available to serving soldiers in the area for a nominal sum of 2d, if boots were removed! Play continued at that venue until the Cricket Club wanted to increase the rent by 50% in 1920, the same year in which lady members were able to join. The Club decided to seek a new ground which was eventually purchased and constructed on its present site in Collingwood Road with the help of generous loans which, in turn, proved a financial burden for several years. A gift of a shelter was made, which at that time was in the Park, for use as a pavilion which, with the existing Bowls hut, would provide the initial indoor facilities. Thus with lots of additional work, such as the construction of ditches, paths, fences and gates, and the purchase of a mower and gift of a roller, the new green was ready for the grand opening. A new notice board was erected which displayed instructions that all members should wear rubber shoes or slips on the new green. The new bowling green was opened on the evening of Wednesday, 11th May, 1921. The Club continued to expand between the Wars and managed to survive the Second World War, most members being too old to actively contribute in the hostilities. Few games were played and the County competitions were not held. The end of the war heralded a new era, but the fortunes of the Club were to take a long time to improve. In 1945 a Ladies Section was formed and the minutes note ‘certain members of the Committee stating their willingness to coach the ladies any afternoon they cared to arrange’! Unfortunately the minutes do not record any reply from the ladies for this offer. 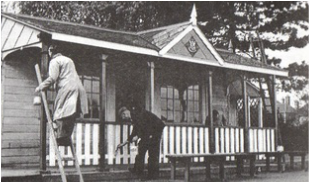 In 1956, as the Club continued to grow, it was decided to renovate and extend the pavilion. Plans were submitted with an estimate for £240 (some £5,000 today)which was raised largely from loans by members. The extension to the pavilion was completed on time and within budget and a representative match was played to celebrate the opening on 15th June, 1957. The years of 1959–1960 saw an influx of new members including one Norman Groves who was to go on to represent England at international level. At the end of 1960 membership stood at 79 men and 20 ladies. With increased membership and more fixtures proposals to improve the facilities were mooted. A sub-committee drew up a proposal and estimates to provide a new building to house men’s and ladies changing rooms with toilets and lockers. In 1964, the Club’s diamond jubilee year, the new changing rooms and toilets were opened. In 1973, following a possible sale of the site to a property developer, it was decided to demolish the old pavilion and extend it to land beyond. More width would be obtained by extending the building to the edge of the existing Green. The Green would be moved two feet towards The Paddocks making a green 42-yard square, so producing the present rink 6. Work started in early 1974 and the committee organised a grand opening day on 25th August, 1974. The new pavilion was ceremonially opened by David Bryant, M.B.E., a name well known in the bowling world. A Special match was then played: Witham .v. Norman Groves Internationals. The Club enjoyed the challenge of playing against a team that included 18 either current or past internationals. Between 1982 and 1984 further improvement work was carried out on the pavilion with further improvements being added in 1989/90 to produce our present facilities. As the Club expended in the 90’s, improvements were made to the electrics, the provision of hot water and the refurbishment of the roof and, in 2010, both internal and external renovations were made possible thanks to a generous legacy. As the century was drawing to a close, changes in society meant that more members had more time on their hands and the use of the green increased. The Club introduced a Tuesday morning pairs league and also entered teams into the Central Midweek Bowling League. With more retired couples joining the Club many of the friendly games, which used to consist of four men’s rinks and two ladies’ rinks, became fully mixed games. Since 1921 the Club land and buildings, which are owned by the members, have been held in Trust by Trustees appointed by the membership. In 2004 the Club celebrated its Centenary with matches being organised against the English Bowling Association (now Bowls England), the English Women’s Bowling Association, Essex County Bowling Association, Essex County Women’s Bowling Association as well as County Group and N.W. Essex Bowling Association teams, all with somewhat varying success . Since that year the Club has continued to retain a healthy membership.